Yea, the reason that was given to me was this. This is a notification that your account is in violation of our Code of Conduct. 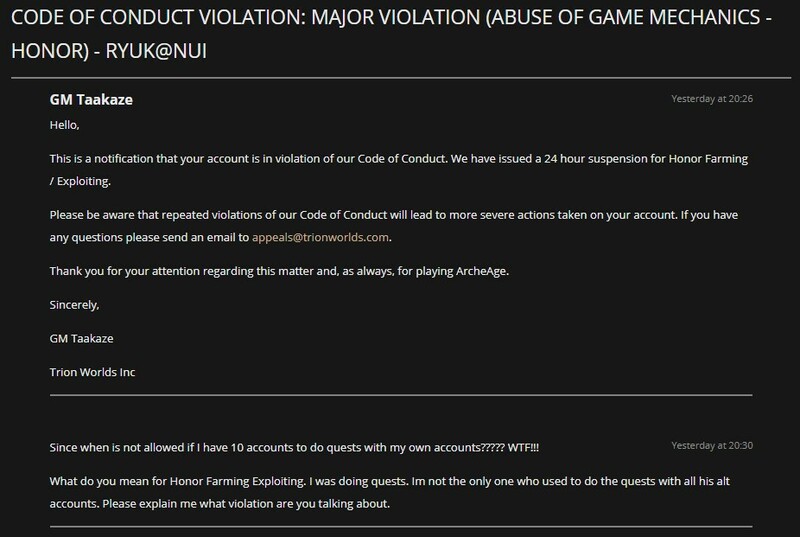 We have issued a 24 hour suspension for Honor Farming / Exploiting. Please be aware that repeated violations of our Code of Conduct will lead to more severe actions taken on your account. If you have any questions please send an email to appeals@trionworlds.com. Thank you for your attention regarding this matter and, as always, for playing ArcheAge. I never did anything except do the quests with them, I dont think I even killed more then 3 enemy players during the questing. So how come servers are not empty now, since out of 100 people in raid I was holding for over 15h that day, not more then 10 people had GS over 2k, rest was just afk alts on honor guy delivering quests, while few of us were killing mobs. Such is the wonderful world of archeage, 24H ban for leading a 3rd world poverty army of nobodies and calling it a raid. Sounds like a legitimate ban, considering that's like 24k gold in honor lunagems. Should've lost that honor instead of that slap on the wrist. So your assertion is that you got banned for 24 hours for honor farming actively playing alts to farm the quests? So just by pure assertion since literally every player on the FS server farmed honor similarly over the weekend and I don't recall anyone getting even a temporary ban is that you were actively playing all of your alt toons that you farmed the honor with? My guess is that you got reported for having 8 toons stuck to you and Trion slapped you with a "not in the spirit" 24 hour suspension. You just need to have them in raid, and afk at he delivery guy for quest, you dont need to run around with them. And yea I had 5 logged at the same time, 4 at the Honor guy and playing with 5th one to kill the mobs to finish the quest. Only main account is unbanned rest still banned even after 24h... No single reply from Trion to further explain their actions still. Yep, seems like we aren't hearing anywhere near the whole story. Well you are hearing full story from my side. What that GM had on his mind I don't know. But this is what I got for the reason.